three pods starting seeds: lettuce, tomatoes, broccoli. The pods were in a different window from last year because of Orange Cat 2. I had no sprouts and we were getting to the 10 day mark. I opened the pods and added more water because they looked dry. I moved them into the better window. The cat is not at fault for the loss of the lettuce pod. Saturday. We had wonderful, open-the-windows kind of weather. The kind where you wish the whole world was off and you could enjoy the weather. The kind where you go home, grab Husband, and take a 1.74 mile walk around the large awesome park nearby. The kind where Husband clumsily knocked the lettuce pod out of the window while I'm at work because he didn't check that the pod was sitting in the window track. I really don't know who is at fault here: me for putting it there or him for not checking. Either way, the lettuce pod was a mess of dirt inside of it (thankfully, it did not pop open and send dirt everywhere. OC2 would have loved that). I was kind of bummed. Actually, when I saw it, I thought OC2 did it. It was right up his alley to just go "WHOOPS. (Not really). Feed me." Nope. It was Husband and he probably could have blamed OC2. Husband's first thought was "You can just fix it." "No. There is dirt everywhere. I have no idea where the seeds will sprout, if they do and if something else sprouts, I'll have no idea what's what. I have to start over." So, he felt kind of bad about it. I said "I want these organic seeds I know we can get [here]. You can pay for the seeds when I figure out the brand name." Sunday, it is colder and we have errands that will take us by the place with the seeds. We go there and at this point, I'm feeling less annoyed with him. I'm also wondering how the destruction of the lettuce pod means I get 7-8 packs of seeds. I forgive him (I forgave him pretty quickly because I decided the seeds weren't really working anyway. They are 5-10 years old. Same group as last year.). I decide to just pay for them myself and he decides he's going to treat me to pizza later that night. At the store, I pick up seven packs of High Mowing Seeds. This includes: Brandywine tomatoes, Cherry Tomatoes, Arugula, Basil, Romain Lettuce, Sweet Pepper, and Spinach. I was so excited. I love the idea of new seeds and possibly non-GMO ones? Yes, please! 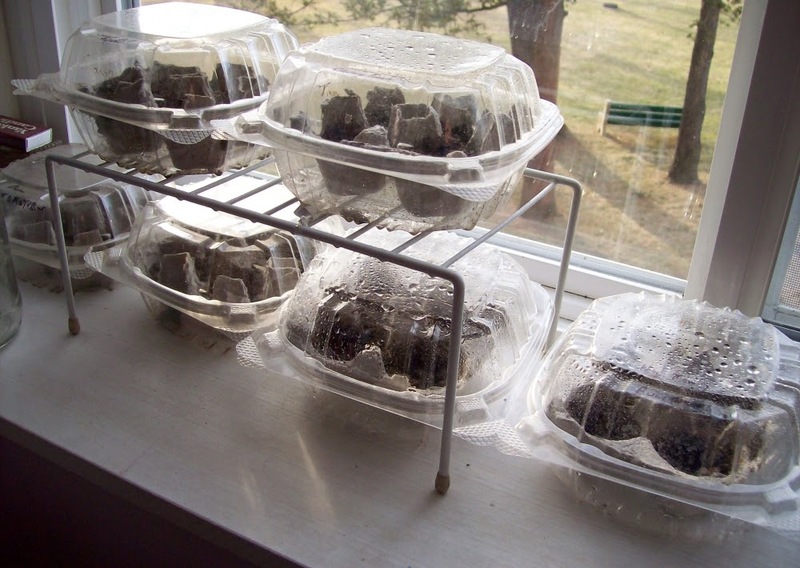 Pods: Small, plastic take out containers, 4 egg slots of a paper egg carton, water, dirt (I'm using compost), seeds. Works very well with good lighting! Original: Brandywine Tomatoes (Burpee seeds, older), Broccoli. 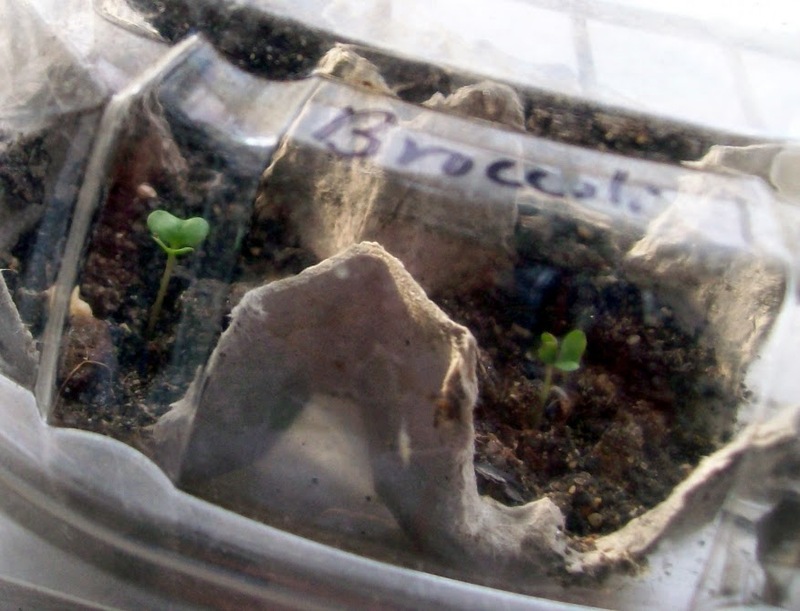 Broccoli has sprouted! Two of the four have come up so those seeds aren't "bad." That's from an older, refrigerated seed pack. Look at those sprouts! Here's hoping the third year is a charm! Read seed packages or research how to grow things. Most will do well where they are, but the lettuce will probably do fine at room temperature during the day and tucked into the pod at night. I learned so much by reading the packaging this year. Let's see if it translates into our own food.